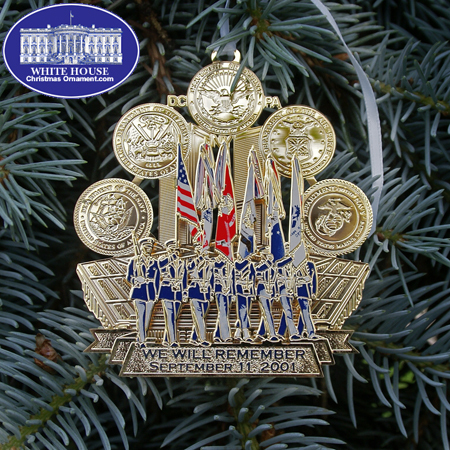 The White House Ornament Collection presents the Remember September 11, 2001 Commemorative Ornament. 9-11-2001 was a fateful day in American history and changed the way the world viewed terrorism forever. We are proud and humbled to present the Remember September 11, 2001 Commemorative Ornament. The detail is such that you can see the nose of one of the color-guards in the foreground of the ornament. There are many facets and aspects to this beautiful 3-D ornament. Starting with Pentagon building in the background, the Twin Towers rise up and form the supporting structure for five military insignias. Clockwise from bottom right they are: Department of the Navy, Department of the Army, Department of Defense, Department of the Air Force and Department of the Navy � United States Marine Corps. The Twin Towers are supported by a rendering of the Pentagon with a caption below the color guards which reads: "WE WILL REMEMBER � SEPTEMBER 11, 2001." To fully appreciate the intricacy of this ornament it needs to be seen in person. This Christmas Gift Idea can serve as either a handsome Christmas display or a White House Christmas Tree Ornament. Whether you are looking for a holiday ornament, a tree ornament, or Christmas collectible, this gift will make any Christmas a White Christmas. 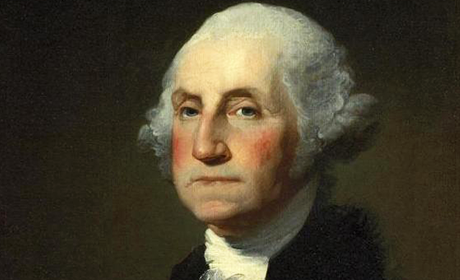 Own a moment of White House history. 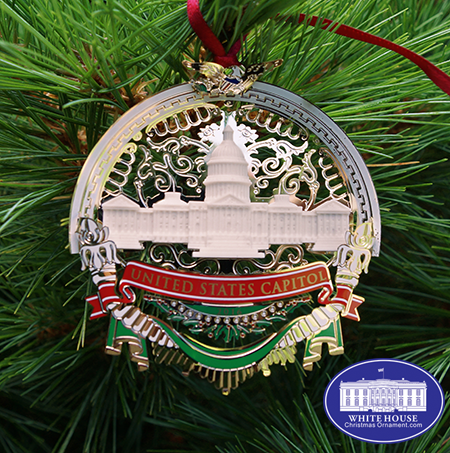 The official 2016 U.S. House of Representatives Holiday Ornament is round and features a 24 karat gold United States Capitol Dome with white enameled columns in the center surrounded by intricate filigree. There is an enameled midnight blue background with white stars. The 2016 Christmas Ornament is made with marble removed from the United States Capitol Building during it renovation in 1995. The gold filigree design comes from the ceiling of the US Senate Chamber. The 2005 Capitol Police Force Holiday Ornament has a round marble picture of the Capitol and has a 24 kt. gold finish. The fairy ball ornament is a great for outdoor wedding, corporate, and or political event decoration. The best part is no more tangled electrical cords! Many of our clients purchase 20 or more. Large orders may take to three weeks to manufacture. Clear and custom color variations are available. The North Portico of the White House is often referred to as "the President's entrance" to the White House. The portico was added in 1830 and was built in accordance of the Federal style of architecture in keeping with the original design. The 2014 White House Christmas ornament celebrates Warren Gamaliel Harding, who was elected the 29th President of the United States of on his birthday, and served our country from 1921 to 1923. Sign up for patriotic promotions, secret discounts, and our newletter.